Benefits of Honey has teamed up with The Mohawk Valley Trading Company and we are having a Honey Giveaway! The prize is one jar of Raw Goldenrod Honey (16 Oz) and the total value including SHI is $17.75. 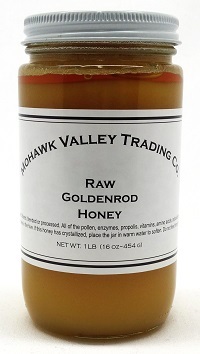 Raw Goldenrod Honey from the Mohawk Valley Trading Company has not been heated, filtered, blended or processed. All of the pollen, enzymes, propolis, vitamins, amino acids, antioxidants, minerals and aromatics are in the same condition as they were in the hive. Goldenrod honey can be dark and strong due to the presence of other nectars. However, when Goldenrod is the major nectar source and weather conditions permit the bees to collect the nectar in great quantities; a golden, spicy, mildly pungent tasting honey is the result as it is here. Goldenrods are a genus of about 100 species of flowering plants in the family Asteraceae. Goldenrods are also used for making tea and decorations, and in some places, they are a sign of good luck or good fortune. Although considered weeds by many in North America, they are appreciated as garden plants in Europe, where British gardeners adopted them as garden subjects way before Americans began to accept them in the 1980s. Goldenrods often bloom from about July until a killing frost. From mid-late August through October, the Mohawk Valley Trading Company places hives on both slopes and the surrounding area of the Southern Kuyahoora Valley and Central Mohawk Valley regions of Upstate New York. Scroll down and post your comment to tell us why you like raw honey! That's all! * You must be 18 years or older to enter. * Contest ends midnight (Eastern Standard Time) 13 April 2019. * Winner will be chosen randomly and contacted by Benefits of Honey. * Winner will have 48 hours to reply with the US shipping address or a new winner will be chosen. * Mohawk Valley Trading Company will ship the prize to the winner within 30 days of contest end. * Physical address required for shipping; no PO boxes, only for those residing in one of the 48 US contiguous states. The Mohawk Valley Trading Company offers the highest quality unprocessed natural products they can produce namely; honey, beeswax candles, maple syrup, maple sugar, handmade soap and natural skin care products. If you are planning to buy honey for its health-benefits, it must be raw honey. Heating honey (pasteurization) destroys the all of the aforementioned attributes. Honey that has been heated and filtered is called commercial, regular or liquid honey. The Mohawk Valley Trading Company specializes in raw varietal honey which is made primarily from the nectar of a particular type of blossom or flower. To capture the unique character and flavor of the blossom or flower, beekeepers must study botanical bloom and flowering patterns when planning hive placement. No pesticides or herbicides are used in their apiaries and although it is not certified organic, Mohawk Valley Trading Company honey (especially their Adirondack Wildflower Honey) is about as organic as you can get from The United States. End of "Honey Bee Gift contest". Back to "Honey as Home Remedy"